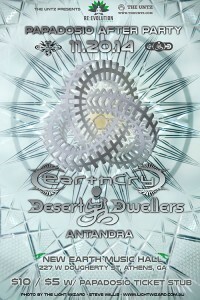 Very excited to be performing an opening set for Desert Dwellers & EarthCry at New Earth Music Hall in Athens, GA.
EarthCry is the musical side project of Anthony Thogmartin: the guitar player, songwriter, and producer of Papadosio. As a beneficial operation, EarthCry donates 50% of all earnings to different ecological initiatives around the world. His debut album, “Hear the Earth, Heal Yourself ∞ Heal the Earth, Hear Yourself” is an electronic journey that focuses on ancient solfeggio frequencies known to aid the human condition.